Amore Pacific responsive display system (2003: Golan Levin and Zachary Lieberman for Frog Design, NYC; art direction by Frog Design). 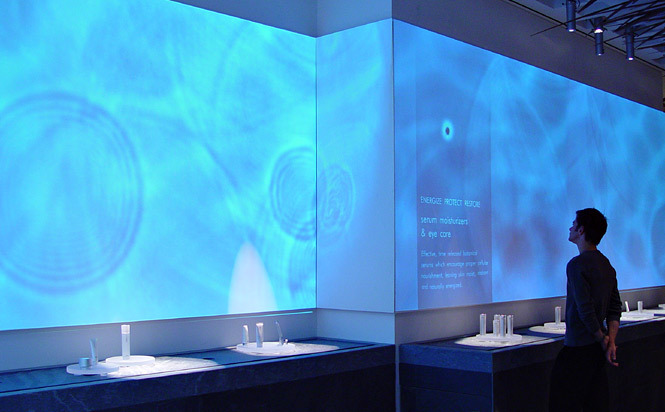 Levin and Lieberman were contracted by Frog Design NYC to create an interactive point-of-purchase display for the SoHo flagship store of Amore Pacific, a Korean cosmetics company. The display consists of an 8-meter long video projection situated above a marble countertop. This projection shows a real-time water simulation in which ripples continually emerge from virtual "droplet" locations. With the help of a motion-tracking computer vision system, visitors walking past the display cause disturbances in the ripple dynamics. When visitors approach the products on the countertop, moreover, pertinent context-sensitive texts appear which describe those cosmetics in greater detail. High-resolution images of the Amore Pacific interactive display can be found in this Tmema photoset on Flickr.